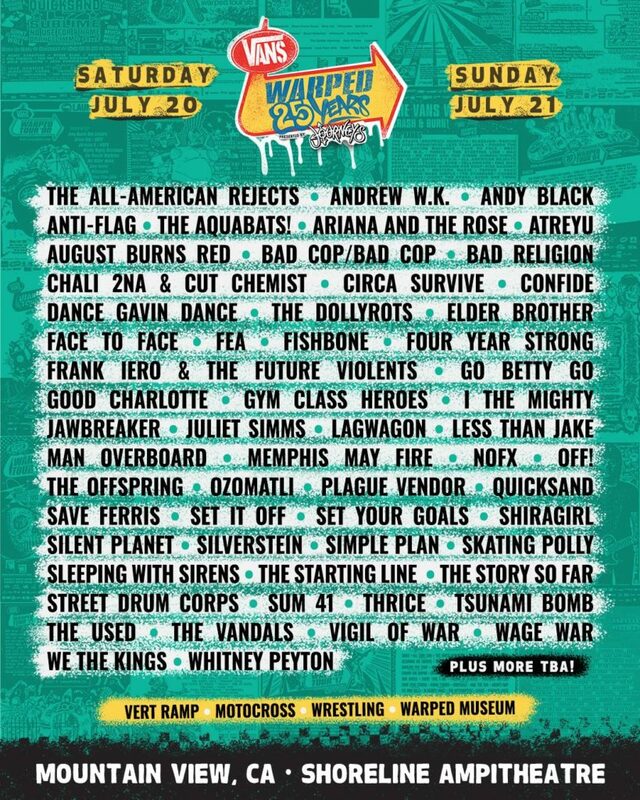 (TRR) – The official lineups for the Vans Warped Tour 25th Anniversary Shows have been announced. On Saturday, June 8, the first show takes place at the Rock and Roll Hall of Fame in Cleveland, OH. 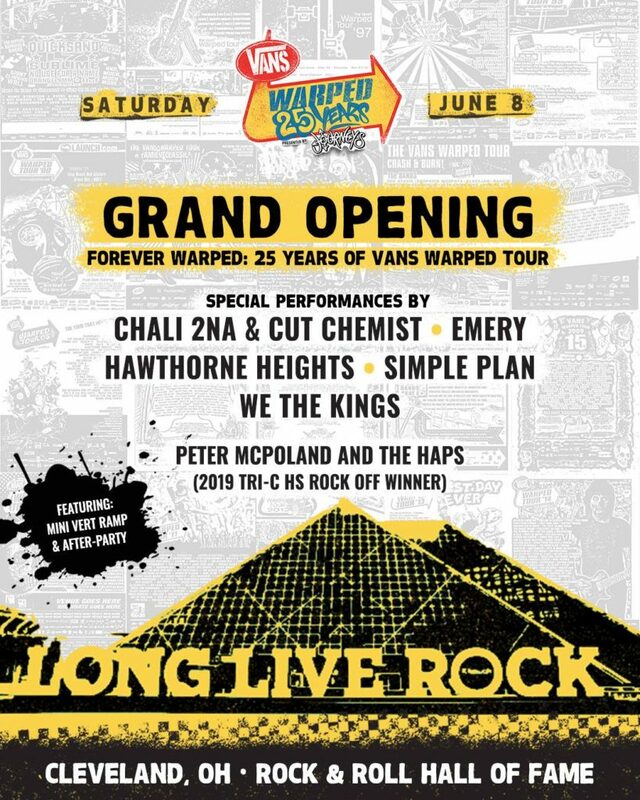 Simple Plan, Hawthorne Heights, We The Kings, Emery, and Chali 2NA & Cut Chemist will perform for the grand opening of Forever Warped: 25 years of Vans Warped Tour. The new exhibit will highlight the history of the iconic punk and alternative festival. 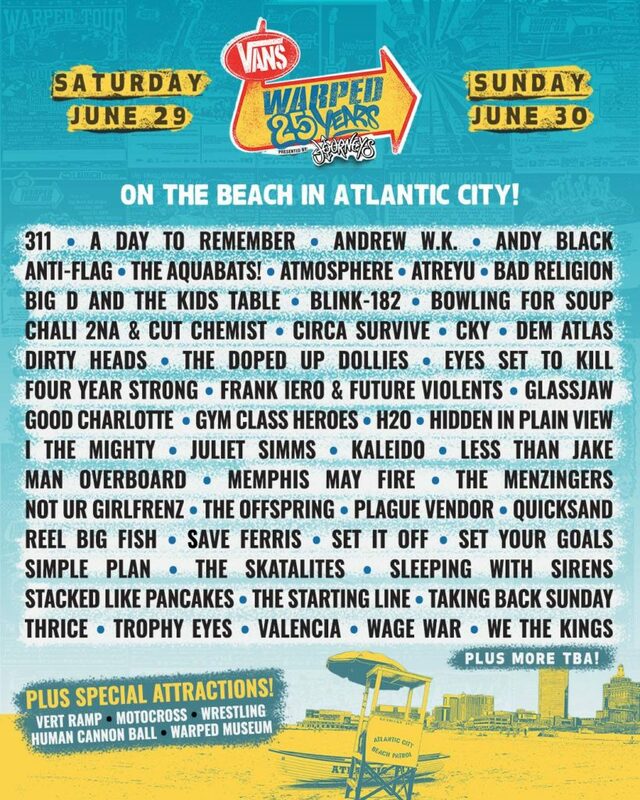 On the east coast, Warped Tour takes over the beach in Atlantic City, NJ on June 29 and June 30. A Day To Remember, Andrew W.K., 311, Good Charlotte, blink-182, Bad Religion, The Offspring, Thrice, Sleeping With Sirens, Atreyu and Taking Back Sunday lead the lineup. The west coast installement is set for the Shoreline Ampitheatre in Mountain View, CA on July 20 and July 21. Slated to appear are The All-American Rejects, Sum 41, August Burns Red, The Used, Atreyu, Jawbreaker, Simple Plan, Less Than Jake, Silverstein, Memphis May Fire, and more.